What are Executive Functions and why I should care about them? 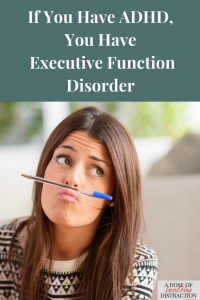 Like most people, I was completely confused when I started researching Executive Functions. Reading the descriptions I thought, “that sounds an awful lot like ADHD.” I am still reading, but it took me a while to figure out how the two diagnoses are related. Still a little fuzzy on what functions EFD includes? This article because breaks down and explains what types of thinking and mental processing constitute executive functions. Reading Dr. Silver’s list is similar to reading the comments on one of my old report cards. Apparently, I have failed at pretty much all of the executive functions, and usually more than one at a time. If you have ADHD you are likely to have EFD, and it is important that you understand what this means to your overall functioning and treatment plan. There was once a 7th grade girl named ADHD Addie. She was a nice girl – friendly and agreeable. Nobody knew that she was ADHD and had been driving herself crazy trying to compensate. Addie was given an assignment. The assignment looked something like this: come up with a science fair project, complete the project to show it at the fair, and then write a short summary of your findings. Addie diligently writes the assignment in her planner, goes home and does not even think about it again until the next time the assignment is mentioned in class. Addie procrastinates about researching the prior year’s projects, and therefore does not formulate a plan. In fact, she does not even think through the steps involved to complete a science project, effectively skipping the organizational step. Addie pulls out her planner to look at the due date for her science fair project when it is mentioned in class. Even then, the momentary panic she feels is not enough to mark her consciousness. She forgets to mention the project to her mother. Addie will not start her project until the weekend before it is due, so there are no adjustments to her plan. What plan? There was never a plan. Approximately 4 days before the project is due her teacher asks some of the students to talk about their projects. Panic sets in immediately and Addie starts to fidget in her seat. When she gets home she tells her mother that she has to complete a project for the science fair. Chaos ensues. The project is turned in a day late. Points are deducted, a low grade is received and the cycle of shame and self-loathing continues. Fortunately, there was an ADDitude sponsored free teleconference with Thomas Brown, PhD that I had the opportunity to attend. 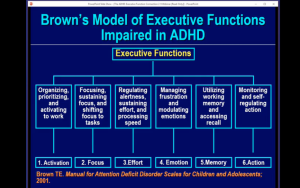 The teleconference, called The ADHD Executive Function Connection, cemented in my mind the information I had already absorbed about EFD. Dr. Brown did a fantastic job of explaining the connection between ADHD and EFD. In short, if you have ADHD you most likely also have EFD. This comes as no surprise seeing as the story above is loosely based on one of my own childhood memories. According to Dr. Brown, ADHD is a developmental impairment of the brain’s management system. Naturally, as we age the demands for executive functions increase incrementally as we progress through adolescence and into adulthood. I also listened to Dr. Russell Barkley’s teleconference with ADDitude that delved into How ADHD Affects Executive Functioning in Adults and Children. Dr. Barkley further improved my understanding of executive functions as they apply to self-regulation. Self-regulation includes skills such as self-awareness, inhibition, nonverbal working memory and self-motivation. I actually wrote about my terrible working memory Here. Motivation is a sticky issue for many of us. Not just because we have trouble getting started, but also because we are so easily sidetracked. Women wear so many hats, we are providers, and mothers, cooks and housekeepers. You and I both know it is easy to get bogged down in the mundane day-to-day stuff of our lives. I know very few women with ADHD who do not feel completely overwhelmed. This is probably due to our lack of self-awareness. For that reason we need to be aware of how these functions factor into our ADHD symptoms. When it comes to ADHD or EFD knowledge and awareness really is power. If we don’t educate ourselves, who will? Lets support each other and entertain each other in the only way I know how. Hang out with me and some other wonderful women with ADHD in our Facebook Group. What executive functions are the toughest for you? Sign up for my (almost) weekly emails and get a downloadable 10 page guide to my favorite ADHD experts.